California cuisine, a style of cooking based on the simple practice of walking out to the garden and gathering beautiful ingredients, may not seem like a natural fit for a Vermont town that's busiest when covered in snow. But Plate chef Aaron Martin has cooked at both Berkeley's Chez Panisse and Vermont's Hen of the Wood. His bicoastal CV helps him do both states justice, even if he can't pick fresh plums à la Alice Waters just yet. The result is a unique fusion — call it Stowe cuisine — that is sometimes very successful, but not always. While nothing I tried on a recent Thursday at Plate was bad, a heavy hand with sugar weighed down some dishes. Word of a new destination gets around quickly in Stowe. I wore out my voice trying to talk over the din of the busy restaurant. Both Persky and our server were friendly and helpful, but often difficult to hear. The roaring crowd was diverse: Across from me, an older couple sat near a young family, whose neighbors were a group of young women out for a ladies' night. Like them, I was joined by one of my best girls, who celebrated with a neatly made Silver Margarita, complete with housemade sour mix and a rim of spicy cayenne salt. She chose it after much deliberation between a cocktail and one of the cult brews available on draft, in cans or in bottles. Most were from Vermont or California, but Oregon, Germany and Québec were also represented. Wines were mostly American, with eight options available via Coravin, a recent invention that allows restaurants to pour wine from the bottle without removing the cork and letting in oxygen. 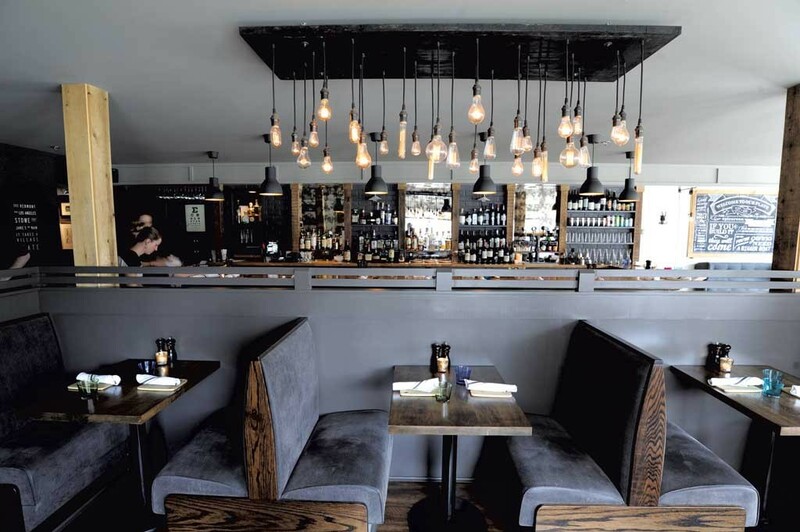 All our fellow guests were well groomed and dressed, as if they'd been locally crafted to fit right in with the handsome dining room, paneled with dark wood and artfully hung with nests of bare light bulbs. Even the bathrooms were aesthetically pleasing, with museum-worthy sinks. Vintage photos of Neil Diamond and Cheryl Tiegs and a highly detailed "Battle of the Network Stars" poster made me giggle. I sat at a booth facing the open kitchen, but was quickly distracted from the fiery action by the arrival of my breadbasket. No knock on the excellence of Red Hen Baking Company, but finding its loaves in the baskets of nearly every higher-end Vermont restaurant can get tiresome. The mostly homemade breads at Plate offered more variety. Rarely can anything eclipse my affection for Jan's Farmhouse Crisps, the Stowe-crafted crackers filled with pistachios, cranberries, rosemary and ground flax seeds. But Plate baker Barbara McLean filled the breadbasket with her own snappy version, along with a cakelike, herb-speckled corn muffin and puffy slices of fresh pita. Spread with sweet, cinnamon-tinged butter, the assortment was irresistible. I would have been happy to go home after filling up on bread, but the appetizers arrived while I was still floating on my carb cloud. The rectangular plate of "crispy pig belly" placed before me was worthy of a magazine cover. Cubes of pork belly and potato had been bathed in a dark, sweet sauce, then decorated with artfully chopped scallion fronds, a single chicharrón and two halves of a medium-boiled egg. I enjoyed the crisp little potatoes, but found the pork belly under-rendered. Some cubes were all gelatinous fat with no meat. 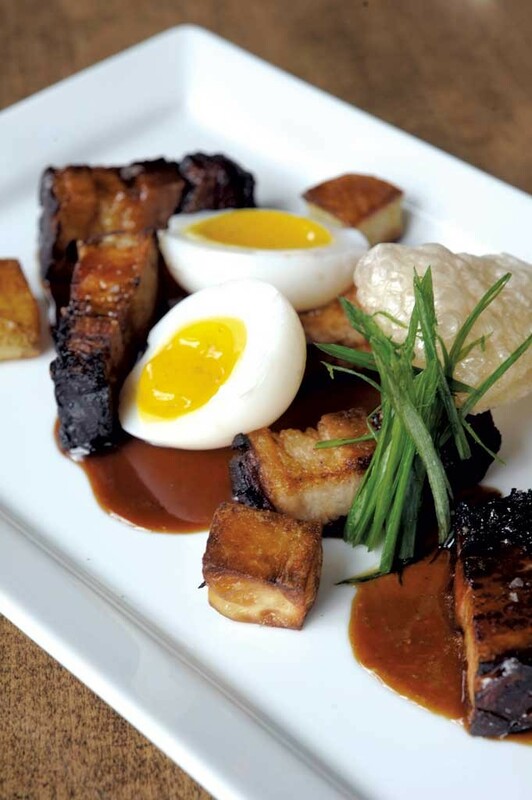 The pork-and-eggs pairing recalled adobo and eggy Filipino breakfast dishes popular on the West Coast. But the fatty meat with an oversweet sauce cried for lightening up, perhaps with a few fresh veggies or a hint of acid. The ramp-and-green-garlic soufflé was equally photogenic, if dishearteningly dense. The flavors in the dish's description didn't pop the way I had expected, though the taste of tarragon soon emerged. An indulgent mushroom cream sauce was a bit heavy but delicious — my dining partner and I quickly dispatched the soufflé despite its imperfections. The Jamie's on Grain salad broke up the heaviness. But oddly, this salad contained zero grains, an error, Persky later told me. But this mixture of sparkling fresh spring greens, sweet-potato cubes, sunflower seeds, dried cranberries and feta was doused in "1905" dressing. A lull before our entrées appeared gave us time to breathe following the breakneck arrivals of our bread and apps. In keeping with the California theme, I'd ordered the Martin's Paleo Diet-style take on ramen. In the place of wheat noodles in broth, the chef serves up a dense tangle of spaghetti squash. This substitution trick only works if you are really, really serious about your diet. I learned last year when I went low-carb that crunchy strands of squash don't satisfy a craving for glutinous noodles. In Plate's ramen, Martin helped make up for the deficiency of his "noodles" with a luxurious coconut broth dotted with chile oil. On top was a mountain of veggies: broccoli, cabbage, mushrooms, and red and green peppers. All were nicely cooked, but a few were drizzled in something that gave them an unwelcome sweetness — particularly in an already-sugary broth. My dining companion found the dish ambrosial. I was more satisfied with the burger. Lightly smoked before grilling, the patty offered a waft of flavor that canceled out the lingering coconut-y sweetness coating my palate. When a burger is very messy, I can't in good conscience describe it as well constructed. This one dissolved into a puddle of beef and sauce as soon as I cut it in half. But damn, it tasted good. Its homemade challah bun, speckled with sesame seeds, was picture-perfect. The bottom layer served as a sponge for the moist beef, a layer of cheddar, the special sauce and the juice of the tangy pickles served on the side. I felt less than elegant digging in, but I let the sauce coat my face and hands as I did. Plate has no fryer, so instead of traditional fries, I was given a choice of sides with my burger. Pan-fried potatoes or grilled sweet potatoes would have been an obvious choice, but I went instead with the velvety-smooth cauliflower-potato mash. Skipping fries made it a little easier on my conscience to order the banana pudding for two. Served in a giant Mason jar, the pudding really could have served three or four modest eaters. Nevertheless, my friend and I nearly finished it, even after three appetizers and two entrées. Besides the breadbasket and salad, this dessert was the highlight of the meal. Intensely flavored pudding came layered with chunks of fresh banana, Nilla wafers and whipped cream. More Nilla wafers protruded from the top of the soft structure like a pair of jaunty berets. The simple dessert was perfectly executed. It was far from the light, airy dishes that often define California cuisine, but, in true West Coast style, its primary ingredient sang like the star it should be. 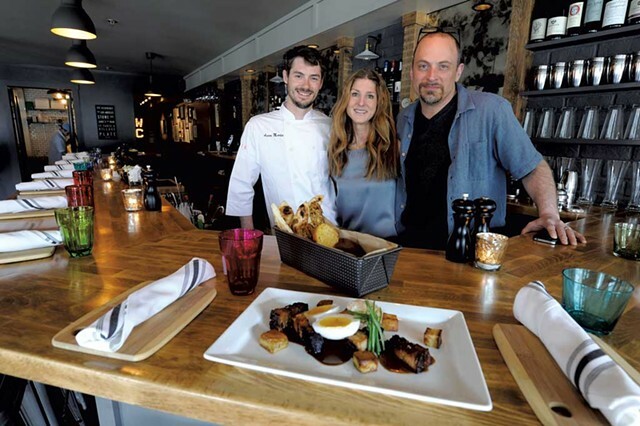 Plate will have to repeat that feat with some of its other dishes before it can assume the essential place in Stowe's dining scene that its name evokes. The flavors of its ingredients should be allowed to stand out independently, rather than being cloaked in sometimes heavy or sugary sauce. As more quality produce becomes available in the warmer months, I'll look forward to Plate's simpler, farm-fresh meals. The original print version of this article was headlined "Stowe Special"